For Christmas I received a new MacBook, which much to my dismay does not have a DVD port. This is not an issue for two of her DVD’s, which are available on iTunes, but for the other 4 DVDs I can’t make them portable. Up until now I have relied on the DVD’s because I liked going to the gym in my building, where I didn’t have wifi. However, I have recently moved and no longer have a fitness room at my disposal. So, I figured it was time to check out the Custom Workout Subscription. Although I love the six DVDs I have and can do a different workout each day of the week, with one day of rest (as Mary Helen recommends) I did worry about plateauing and not having enough variety in my exercise regime. I will say, this has yet to happen, although the workouts have become easier (some I couldn’t actually get through without pausing at first) I do still feel the burn of all the DVDs I own. However, I am very excited to have access to a larger library and love that two new workouts are released each month. I also love some of the special releases ie. her Nutcracker inspired workouts she releases around the holidays and some of the workouts which are very dance heavy. 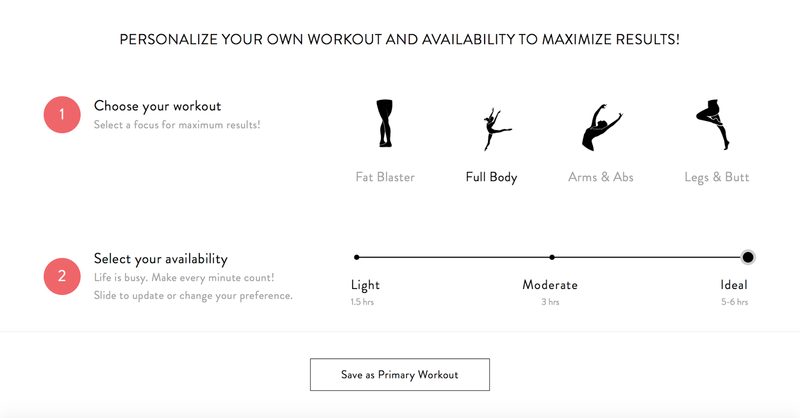 With the Custom Workout you can decide what you would like to focus on (ie. fat burning, full body, or specific body part) as well as how much time you would like to commit each week. From this information, you will be supplied with a workout schedule according to your goals. You can change this up as you like and you also have full access to the streaming videos, if you would like to fully customize your own workout. I personally like to do a week of the Custom Workout and then reset it, so I am constantly changing up my workout to keep things interesting. As the Custom Workout gives a maximum of five days a week, I will either do a DVD on the 6th day, or choose from the streaming library. If I feel particularly sore I may take that day to do some of her stretching videos. I love Ballet Beautiful and recommend it to everyone who asks about my workout regime. I relied on her DVDs for so long, but I am glad I made the transition to the Custom Workout Subscription. One of the greatest benefits of the subscription is the large & ever-growing library of workouts. It really keeps you on your proverbial (and literal!) toes. I also like that I don’t always know what to expect. For example, some of her DVDs are more difficult than others and I find myself dreading the difficult ones, especially if I have to do them once a week. With the Custom Workout I am constantly switching up my workout, so it doesn’t become routine, monotonous and anticipated. I will have some upcoming reviews on her remaining DVDs and hope to take a class the next time I’m in New York as well!